So your kid is not eating their lunch. Sometimes this makes us go a little crazy, sometimes this can make us worry, and sometimes this can make us worsen the situation by sending more and more food, more and more options, to hopefully tempt said kid. Try the reverse. If your kid is not eating their lunch. Try sending less, not more. Try fewer options, and smaller quantities. If lunches look more manageable and not so overwhelming a kid who before didn’t bother with any of it before , might just give it a shot. Yes, I am sure the idea of sending your child off to school with a small or even tiny packed lunch might seem to go against everything you should be doing as a parent. But if they were coming home with untouched lunch boxes any way, then it is worth a whirl. Once they start finishing the fewer items you send, once they get into their ‘eating lunch groove’.. then you can start increasing the quantity and variety again. I look at this from two perspectives. Therefore it is worth to revisit tip one. 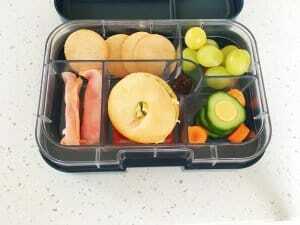 It is worth trying to send a balanced lunch box with most if not all food groups covered. 2. When is A Third not a Third? When its a school lunch box! Yes kids can eat up to one third of their nutrition requirements at school. But if you have a non school lunch eater, you don’t have to resort to filling their lunchbox with junk just so they will eat something. There is still ample time in the day for them to catch up. Just give them a great afternoon snack, maybe two, and a great dinner, and all will be fine. So that’s it. The 6 things I think parents should keep in mind when packing their kid’s lunch box. Having inspiration for packing lunchboxes can also help. These are some of my favourite sites for lunchbox ideas. Kidgredients, Healthy Little Foodies, Eats Amazing and My Fussy Eater. What got my attention the most was how you said that when it comes to packing lunch for kids, it’s best to remember that as a parent, I’m the one who should set the standards of what they’re supposed to eat. The only problem is that I’m not very confident in my ability to pack the best and healthiest lunch for my little prince. I think I’ll settle for hiring someone to do the lunch packing thing for me and just try to figure it out later. Thank you for sharing though.